The team of volunteers left England on the 27th December to start the journey across Europe, arriving in Romania the following evening. A few days were spent in Romania delivering gifts to those TEECH have know for over six years from prior summer projects, visiting Tileagd, Miercurea Nirajului and Galesti. The journey on into Moldova would be achieved before new year, in time for customs and their holiday closure! The weather started off mild and then turned to snow and minus 10 degrees. The summer 2016 project will be in the village of Ivancea, therefore the team spent a day at the school giving out shoeboxes to the children and also food parcels to the older generation in the village who are not able to get out of their homes easily. Visits were also made to the villages of Molovata and Cruglic to see Katie and Israel, two ladies from the US Peace Corps who supported TEECH in August 2015 during the project in Bolduresti. 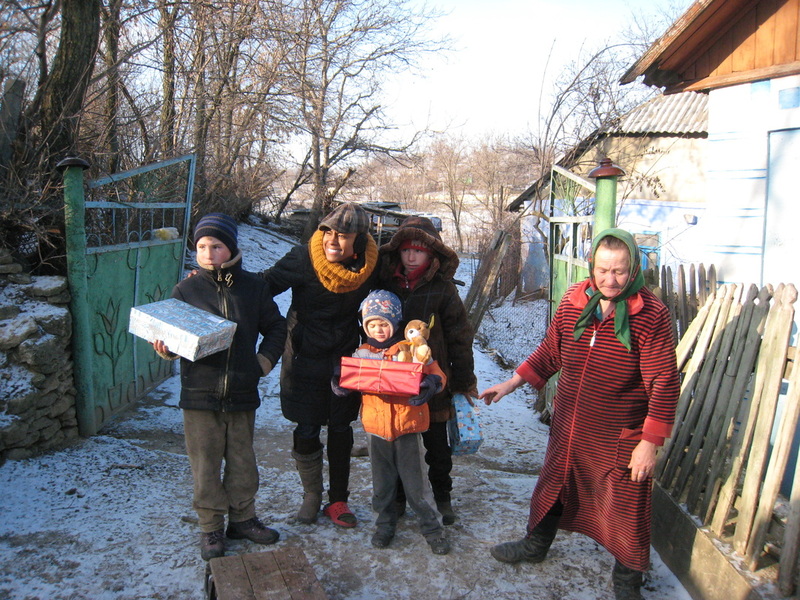 They had both spoken to the social workers and directors of the village schools to identify families in the village who are in most need, so we could visit them and bring a bit of Christmas cheer with shoeboxes and food. Bolduresti and Balanesti were also visited, both locations of prior TEECH summer projects. It is also nice for volunteers to re-visit projects, see what difference the toilets/bathrooms are making to the school, children and community. 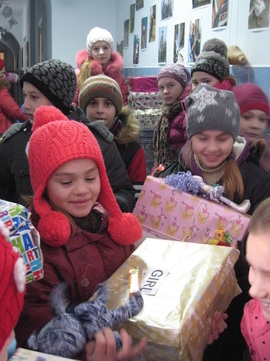 ​In both locations the children gathered at the school to sing carols and say poems when Santa Claus gave out shoeboxes. 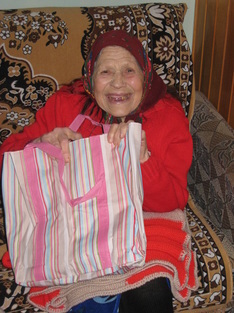 A whole day was also spent in each village visiting homes of the elderly to give out food parcels. Hospital Beds from Harwich Hospital obtained by Mary Rothwell were delivered to Nisporeni Hospital, which are much needed. The current beds in the hospital are in poor condition and are very basic to say the least. TEECH was award a 'gratitude diploma' from the Nisporeni region to thank the charity for the support given to the region over a few years in terms of aid and sanitary conditions. 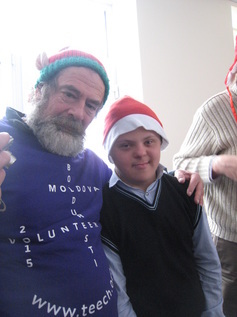 The team were invited to visit the Phoenix Centre in Riscani, northern Moldova. A charity run by a Moldovan lady (now living in England) has set up a day centre for children with disabilities. The team were delighted to visit and see how much progress the children have made just in the months since the centre was open. Previously the children would spend time only at home with little or no help but now have lots of interaction with others. The picture in the header of this newsletter is also from the centre. The next stop on the journey would be Capresti, visiting a home for the elderly and the children of the village. The final stop would be to the ladies of Risipeni at the Casa Helen home and the orphanage in Bosca. The children were extremely excited to receive presents and extra sweets handed out by the team. 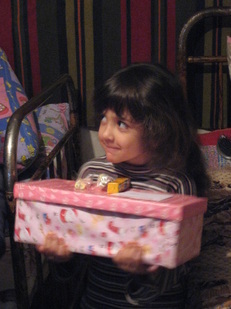 TEECH would like to THANK everyone who completed shoeboxes and food parcels. A total of 1,700 were donated which made the trip such a success. The team would also like to thank Bob Parfitt of Refugee Relief for donating new shoes and coats which were extremely welcomed. Ora International, particularly Veronica Martinuic for organising the paperwork for the lorry and providing accommodation. 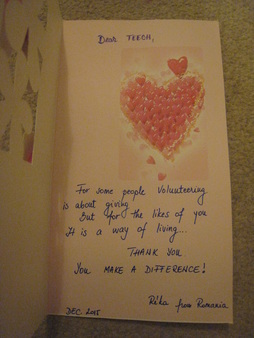 Thanks also goes to hosts at every location the team visited, providing food and a place to stay for us all. TEECH received thanks for one teacher in Romania (see card below) and from the children in the photo below from a small school in Maiad.